Nationality: American. Born: Austin, Texas, 6 November 1970. Education: Attended New York University; studied acting at McCarter Theatre, Princeton, New Jersey; Carnegie Mellon University. Family: Married the actress Uma Thurman, 1 May 1998; one daughter. Career: Co-founder and artistic director, Malaparte Theatre Co., New York, 1993—; directed Lisa Loeb music video, Stay , 1994; published first novel, 1996. Address: Creative Artists Agency Inc, 9830 Wilshire Blvd, Beverly Hills, CA, 90212–1825; PMK, 1776 Broadway, Eighth Floor, New York, NY 10019–2002, U.S.A. The Hottest State , Boston, 1996. Interview in Chaplin (Stockholm), vol. 37, no. 2, 1995. Interview in Interview (New York), April 1998. Newsweek , 18 January 1993. Times (London), 29 April 1993. Boston Globe , 18 February 1994. New Statesman and Society , 24 June 1994. Time , 30 January 1995. Rolling Stone , 9 March 1995. Ethan Hawke and River Phoenix were born the same year and made their debuts in the same film, Explorers , at the age of fifteen. Given the latter's meteoric rise to fame, it is perhaps surprising that Hawke (admittedly in the lead role) makes by far the stronger impression—this under a director not noted for his sensitivity to actors (or indeed for much else). Immediately, the film establishes the basic rudiments of his persona/personality (his honesty as an actor makes it impossible to distinguish the two): idealism, accompanied by a bright and eager intelligence; sensitivity; something of the "dreamer" (literally, in this first film); vulnerability; and a certain defensiveness and desire to please. The permutations of these attributes will be the defining factors of Hawke's career to date. If his subsequent work invites one to add a further component, it is reticence. Hawke never seems to be forcing himself on the spectator's attention, he never seems to be saying "Look at me, I'm acting ," he never seeks to grab the limelight from his fellow players or steal a scene. But if we respond to such courtesy with an attentive courtesy of our own, we shall notice all kinds of things going on, subtleties of response, of inflection, of expression. He is not conventionally handsome but he has a most expressive and interesting face; from early in his career he seems to have wanted to distinguish himself from the seemingly endless parade of "teen idols" who come and go in modern Hollywood cinema with such monotonous and predictable regularity. Three further teenage roles deserve mention. In Dad he makes the most of an underdeveloped supporting role, as businessman Ted Danson's estranged son, about to drop out of school and live on a five-person mixed-gender commune in Mexico. Without much help from the script he manages to communicate the character's gentle strength, pleasure in being alive, and determination to live as he chooses, so that his share in helping his father rediscover his full humanity is convincing. Dead Poet's Society gave him the opportunity to project idealism and integrity at whatever personal cost. The generally overlooked Mystery Date is an unexpectedly enjoyable light entertainment somewhat reminiscent of those Bob Hope comedy-thrillers of the 1940s in which, through mistaken identity, an innocent, naïve, and seemingly somewhat helpless young man becomes sucked into a chain of crazy, comic, and violent misadventures, comes out on top, and gets the girl. In place of Hope's smartass wisecracks, we have Hawke's vulnerability and panic balanced by his spontaneous inventiveness and resilience. The film enables him to demonstrate a real gift for comedy. He was twenty when he made Mystery Date , but playing seventeen. His adult career really begins the same year with the complex and intelligent A Midnight Clear , as the leader of a group of young GIs in France during World War II. Hawke is clearly a serious and intelligent actor who, from the point in his career where choice became possible, has chosen offbeat projects that must have looked very interesting on paper but do not necessarily result in interesting films. Alive , the "true" story of the South American rugby team whose plane crashed in the Andes, must have appeared irresistible, but Frank Marshall's film is populated by a set of walking cliches mouthing more of the same. Hawke's role is of some interest: he is unconscious through most of the early part of the film, hence virtually unnoticeable, and only gradually rises to prominence; he becomes the first to propose cannibalism as the only means of survival. If there is some improvement in the film's last twenty minutes (despite its shamelessly opportunistic use of religion), this is partly because the basic material cannot but be affecting, but more because Hawke takes over the leadership and the film. 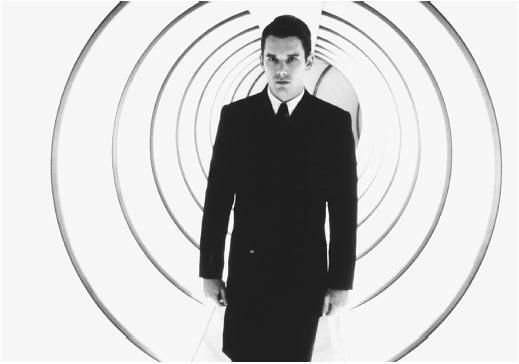 Gattaca takes us into a sub-Orwellian Brave New World in which people are necessarily inexpressive, but the film itself is pretentious and flat. Snow Falling on Cedars , about the persecution of Japanese Americans during World War II, looks very beautiful, but the actors and the subject drown amidst the flood of lovely images. Of these three films it is the most self-conscious about "Art." All one can salvage are the last few minutes, where Hawke contributes one great and unforgettable moment of emotional authenticity and "Art" suddenly becomes art. For aspiring and ambitious actors the "Big Subject" has always been the "Big Temptation," often with disastrous results. The moral: forget the Big Subject and choose the director you can really work with. It happens, however, that one of Hawke's finest films would seem, superficially, to qualify as a Big Subject: Cuarón's Great Expectations. Yet, if one forgets Dickens (which the film effectively helps one to do), is the subject in fact so big? David Lean thought it was, and made one of the most overrated films in the history of cinema. Cuaron makes a film , rather than an "adaptation," conceiving the whole in Minnellian terms of "camera choreography" but at the same time getting splendid performances from his players. The protagonist (no longer "Pip") is beautifully realized by Hawke in a characteristically thoughtful and disciplined assumption. Yet Great Expectations remains above all a director's film. Hawke's finest personal achievements to date are, significantly, in ensemble movies in which performance is crucial but interaction even more so. Alive was of course, on paper at least, an ensemble film, but there is no interaction among the actors whatever: each speaks his line and you pass on to the next. Reality Bites is far too treasurable to be allowed to slip into oblivion just because its concern with Generation X is currently considered dated. No Big Subject here: just five characters trying to react honestly to a culture they feel has failed them, or just five admirable actors playing with or against or off each other with a quite magical aliveness and energy. Hawke is superb as the group's "drop-out" a role that allows expression of a side of his persona seldom visible, a bitterness and cruelty revealed as a defence against pain and extreme vulnerability. Before Sunrise came out in 1995, and a year later Hawke published his novel The Hottest State. Placed side by side they complement each other perfectly: both are studies of a single man/woman relationship, tentatively successful in the film, disastrous in the novel; both are centrally concerned with the problems of gender, the problems, today, for young men and women trying to meet, understand, and accept each other. One senses that Hawke is himself closely involved with each male protagonist, and it is therefore most commendable that the novel, written in the first person, is essentially a self-critique of its narrator. Before Sunrise is one of the cinema's perfect films. Hawke and his costar Julie Delpy collaborated on the script with Richard Linklater and his screenwriter Kim Krizan, supplying some of their own dialogue; the film belongs to the four of them, carrying the concept of ensemble to its ultimate. Here everything jells, and the result is one of the touchstones of screen acting, every interchange seeming as much lived as acted. Hawke also shines, in a more comedic role, in The Newton Boys , but the film offers fewer opportunities for intimacy. Two cameo appearances should be noted, as extensions of his range. His five-minute turn in Floundering offers a devastatingly intense and painful rendering of hopeless drug addiction. His slightly larger role as a children's counsellor in Joe the King was shot in a single day, with the character substantially reconceived and rewritten (in conjunction with his long-time friend director Frank Whaley), intelligently transformed from a somewhat cliched "caring liberal" to a tired and jaded man incapable of offering the title kid much help. In 2000, Hawke began work on his first film as director. Hamlet provides the perfect climax to this celebration of Hawke's abilities. Opinions will vary on the success of Almereyda's audacious modern-dress adaptation (it seems to me brilliant and consistently riveting), but surely few will wish to dispute the success of Hawke's performance. His Hamlet—painfully sensitive and vulnerable, deeply disturbed, the borderline between feigned and real insanity increasingly blurred—is the best on film to date, Shakespeare's dialogue (what a wonderful screenwriter he has proved to be!) made to seem completely natural without harm to its poetic strength, a Hamlet equally free of Olivier's narcissism or Branagh's alienating self-consciousness. The centuries of encrustation that have produced what we know (and dread) as "Shakespearean" acting disintegrate before him; he plays the role as if born for it.